We had our official US Power Squadron Boat Safety Inspection today! When I first started sailing, I had no idea that there were actual Federal Safety Regulations for boaters. We wanted to be compliant so I went looking for information. There are SO many resources out there but I found this very comprehensive brochure to be helpful. When we bought Dos Libras, we stepped into a new category under the Federal Boater Safety Requirements. Boats less than 40 feet in length have slightly different requirements than those in the 40 to 65 ft range. I wanted to make sure that we had all of our I's dotted before we ventured further into Florida waters and beyond. The United States Power Squadron's website provides a wealth of information. 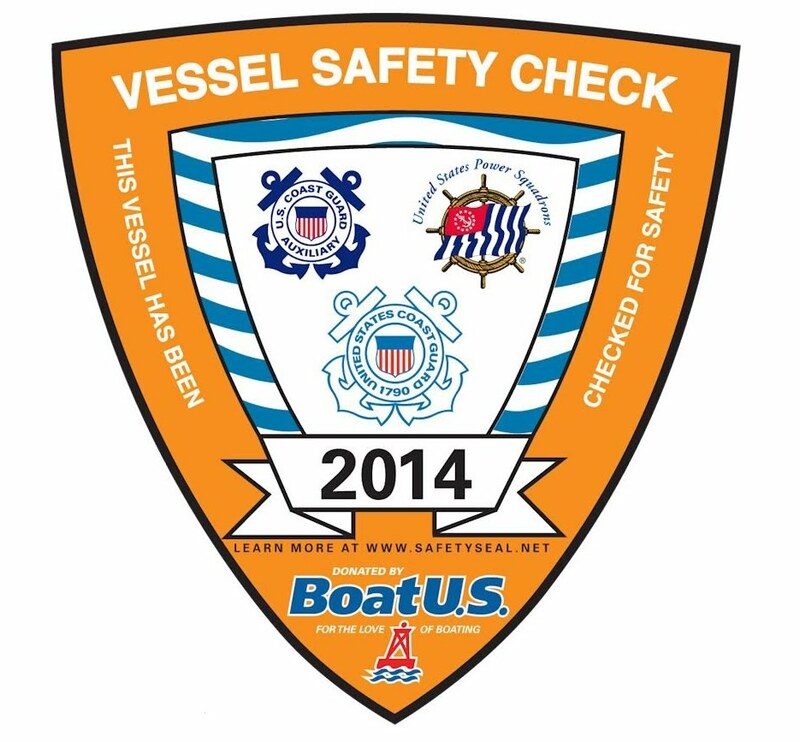 They also offer a free Vessel Safety Check for boaters. All you have to do is ask! You can take their "Virtual Safety Check" online but we chose to have a one-on-one inspection of our boat. Why? I'm understandably concerned about safety as we sail off into the sunset. But there are other benefits to having the VSC decal displayed on our boat. 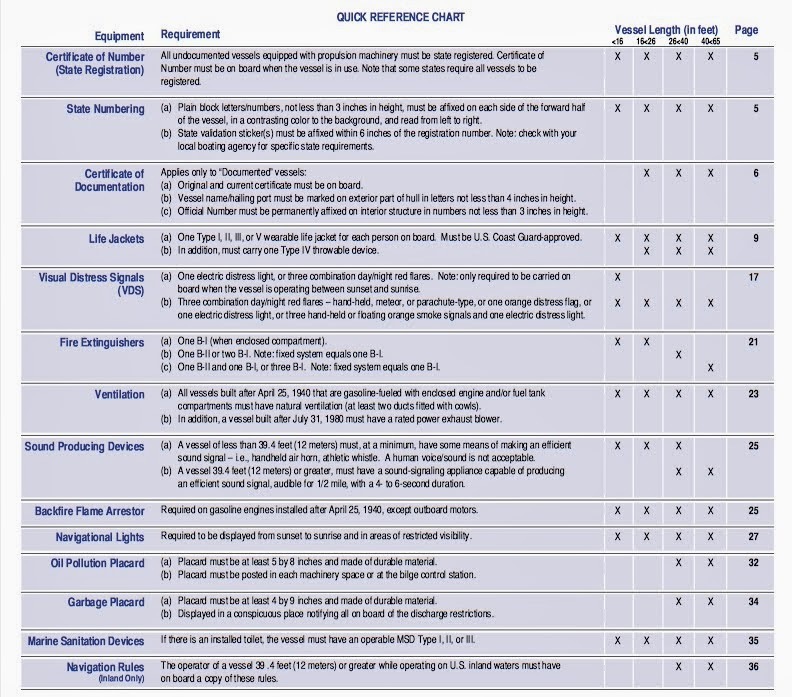 Coast Guard, Harbor Patrol and other law enforcement entities may be less likely to detain us if they see that we carry a current inspection certificate. Secondly, West Marine will knock 10% off of your purchase price for Safety Equipment. Also, many insurance carriers will give a discount on your premium renewal if you have the Safety Certification, and our insurance is coming up for renewal very soon! We went over the list of requirements to make sure that everything was in order. 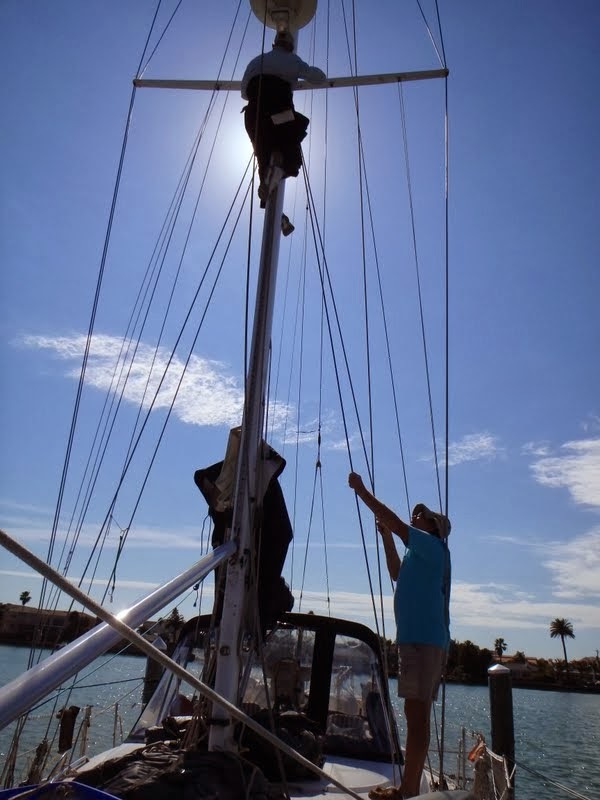 We had one light that has been working intermittently so Bruce engaged the help of our neighbor to hoist him up the mast for a quick bulb replacement and to check the connections. After that we were ready. We were contacted by Mr. O'Brien after completing the USPS online request. It took a couple of weeks so do it when you'll be staying put for a bit. Ted came out to our boat and went through the safety requirements with us. He also gave us some advice about cruising to many of our planned destinations. Did you know that your flare gun can be considered a weapon? Ted advised that we declare it as such when entering the Bahamas, along with the number of cartridges we carry. We had an informative discussion about our fire extinguishers. We carry B-C extinguishers and my question was about how long they last. Our extinguishers are still within the "green" on the gauge, but how long do they really last? Ted taught us how to listen for the powder inside to be mobile. He said that if we could hear and feel the powder moving around inside the canister when turned upside down, it should be fine. He also mentioned that this can be done monthly to make sure the powder doesn't pack. Another tip was that sometimes the gauges stick, so they can be unreliable. We also discovered that we aren't adequately covered for all types of fire, so we'll be using that West Marine discount for a couple of new Type ABC extinguishers. Did we pass? Only with flying colors!!! We had everything in order and produced it all quickly. We even impressed Ted when we pulled out our Waste Management Plan document, required for boats over 40 ft! He gave the impression that few boats had these. I affixed our sticker to the mast with a feeling of pride and relief. You don't HAVE to have your vehicle safety checked, but for us... the most important reason to do it... is peace of mind. I feel more confident in our boat and have a better understanding of what we can do to be safe while we Cruise. UPDATE: We went to West Marine to buy some ABC fire extinguishers and some extra flares and smoke sticks. They didn't know about the discount and if I hadn't had the 10% off coupons on the iPad, they wouldn't have discounted our purchase. So take the coupons with you! I just recently learned (via our surveyor) the difference in fire extinguishers. I ordered three ABC's to replace two of the out dated BC extinguishers on our boat. Glad to know that we have our boat moved to the Gulf we can have it inspected for free! Yes, our boat came with two B-C Extinguishers. We just returned from West Marine where we bought two ABC extinguishers. We also got some extra flares and used our 10% coupon. West Marine didn't know about the discount so having the coupon made it possible for us to get the discount.